Paul Farmer is a Harvard medical school professor who spends most of his time in Haiti fighting tuberculosis, AIDS and more generally poverty, both in Haiti and around the world. As someone who has dedicated his life to providing medical care for the truly impoverished, Farmer is a hero for my girlfriend, a med student, but somehow I always found him to be unsettling. Tracy Kidder is the author of Soul of a New Machine, a Pulitzer Prize winning ethnographic analysis about the motivations of geeky computer engineers. It was the most compelling non-fiction book I have ever read and a crucial part of my education as an economist. 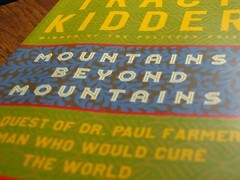 As soon as I saw that Kidder had written a new biography, Mountains Beyond Mountains, subtitled the "The Quest of Paul Farmer, A Man Who Would Cure the World" it was a book I bought at once for the both of us. Kidder somehow accurately articulates exactly what always unsettled me about Farmer. It is some combination of his holier-than-thou crusade for the poor, his purposeful inspiration of guilt into all around him, his Communist ideology, and his utter disregard for efficiency. However, through personal narrative, Mountains Beyond Mountains leads the reader through Kidder's budding appreciation of Farmer as he they travel together in the course of Kidder's research for the book. Kidder helps the reader understand Farmer by showing how the medical crusader overcame Kidder's own misgivings, partly through his important academic contributions to the understanding of epidemics, partly through his immense personal dedication toward the eradication of poverty, but primarily through the inherent goodness of Farmer's morality which Kidder comes to appreciate. vWVpCg The best blog you have!